Small cushion-forming alpine with tight rosettes of lime encrusted, grey leaves. Lilac-purple flowers opening from reddish buds in March and April. Very sharply drained alkaline or neutral soil in full sun. Avoid excessive winter wet. Can be grown in tufa. 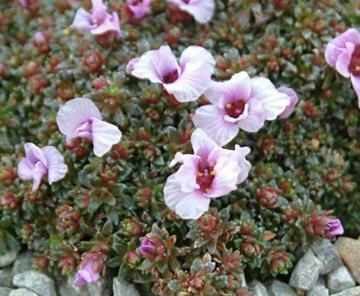 Suitable for alpine troughs, rock or scree gardens. Porphyrion section, Kabschia subsection saxifage. Hybrid raised by Jan Bürgel in the Czech Republic in 1994.